On March 10, the ICO of the operating platform SKYFchain was launched. This is the first B2R (Businesses-to-Robots) operating platform for unmanned cargo logistics of its kind, based on the blockchain technology of smart contracts. The system is available to all market participants and allows implementing logistics schemes and financial calculations of any complexity in SKYFT tokens. SKYFchain is an open blockchain platform for keeping records of all the key events occurring with cargo robots and their interactions in the supply chain. Each transaction is recorded on the platform. Each record has its own cost depending on the type, frequency, and complexity of transactions and is denominated in a traditional currency. All calculations within SKYFchain will be processed in SKYFT tokens, as required by the smart contract logic. Since the number of participants and the number of transactions in the platform will constantly be increasing, while the number of the tokens is fixed, the cost of the SKYFT token will be increasing as well. SKYFT tokens will be freely quoted on the main cryptocurrency exchanges. Next to that, the SKYFT tokens holders will receive their share of the cost of every transaction made within the SKYFchain platform. Traditional cargo logistics is one of the most complex industries. It is extremely dependent on the human factor; a lot of manual labor is used in the transportation process. In order to continue their expansion, companies will have to change the freight industry itself. Further optimization of the market of traditional logistics is simply impossible. Most of the proposed iterations make it possible to reduce only tenths, and sometimes even hundredths of a percent of costs, or barely slightly reduce the time spent on delivery. The future of the industry is unmanned cargo logistics. Such market giants as Google and Amazon have already begun to test using UAVs for small parcels delivery, and UGVs for the service of the warehouse complexes. The actual system is not transparent enough. It includes dozens of mediators, and the number of their interactions with each other within a delivery can sometimes exceed a hundred or even a few hundreds. Blockchain can help to solve this problem. The technology will naturally fit into the logistics market and will make it more efficient in the very near future. Furthermore, blockchain is necessary for the full implementation of unmanned delivery, whether it is to be done by drones or car wagons. It is SKYFchain that can unite all the market participants as based on the same distribution system. This will remove a lot of problems, starting with the approval of the delivery route for robots and ending with the calculation of insurance fees and payment transfers. Not only will this approach reduce transaction costs, increase the transparency of logistics schemes and calculations, but it will also increase the speed and quality of cargo delivery. The transition of logistics to the unmanned systems (rather ground than aviation) is a matter of a very short time. SKYFchain is the only solution able to satisfy all market participants. With the help of SKYFchain, we will support the logistics industry transition to the unmanned systems, which will result in a significant reduction of the transportation costs. All consumers will benefit from this, but especially those who are located in the least developed regions, in terms of logistics. “I’m pleased to support this innovative project as an advisor”, says Michael Terpin, Founder of Con agenda. 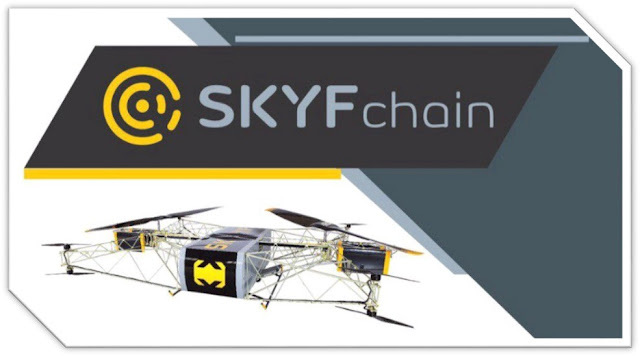 The first cargo robot to transfer the transaction history to SKYFchain will be SKYF, an autonomous freighter drone (useful load up to 400 kg, flight time up to 8 hours, range up to 350 km) developed by ARDN Technology. SKYF will use SKYFchain exclusively to operate hundreds of freighter drones that have already been ordered by the largest oil/gas and logistics companies around the world. SKYFchain is open to any other manufacturers of unmanned drones, including cars and cargo ships. It is also open to logistics providers and financial organizations and has every chance to become a universal tool, a standard for the unmanned logistics market. Within 5 years, ARDN Technology plans to send over US $50 million to buy SKYFT tokens from the market and use them to invest in further development of SKYFchain. The SKYFT tokens emission conforms the international legislative regulation of the blockchain to the maximum extent. the remaining 391,700,000 will be sold at a regular price of $0.065 per token! On March, 1-6 the SKYFchain pre-ICO was held and reached $2,000,000. The token pre-sale was supported by over 4000 people. $500,000 was raised before the official sales launch. For more information about SKYFchain please visit skyfchain.io and download the project whitepaper.